How do you enter? Go to All Recipes Facebook page and like it. Create a new board on your Pinterest page called “Best Thanksgiving Ever.” You must pin images from Better Homes and Gardens or All Recipes websites, including the image above. Once you have completed your board, return to the facebook page to submit the URL address. Deadline is 11:59 p.m. ET on November 25. One person will win $5,000 and five others will win $1,000 each. 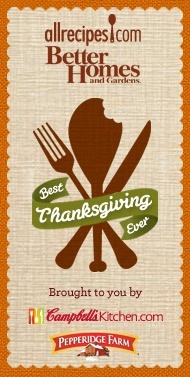 My Best Thanksgiving Ever Pinterest Board. It’s a great way to start thinking about Thanksgiving – and who knows? Maybe win some money! Leave me a comment and let me know if you are going to enter. Check out the last Pinterest contest I entered here – Better Homes and Gardens Dream Home.